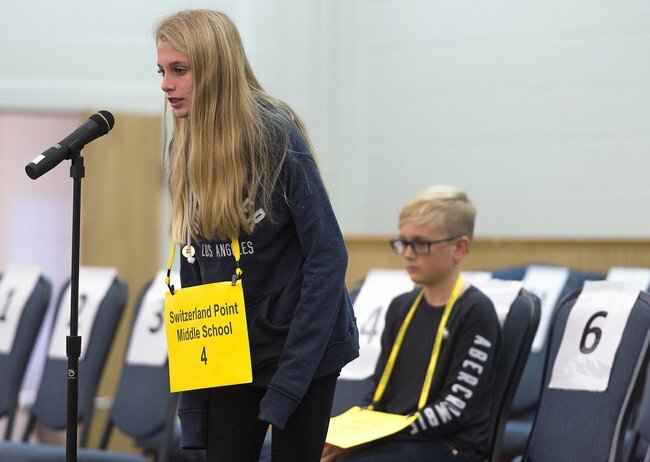 Carly Miller, an eighth-grade student at Switzerland Point Middle School, won the 2018 St. Johns County School District (SJCSD) Spelling Bee held January 17 at First Coast Technical College. She won by spelling the word “piccolo” correctly. Carly is the daughter of Carrie and Jeramie Miller. Jackson Willis, an eighth-grade student at Liberty Pines Academy, is the runner-up. He is the son of Monica and Benjamin Willis. Both students will advance to the JAXSPORTS Council Regional Spelling Bee on Friday, March 9 at the Florida Theatre in Jacksonville. Thirty-four elementary and middle school students from 29 public and five private schools competed for the honor of representing St. Johns County. It took 26 rounds for the winner to be determined. The participants were congratulated by Deputy Superintendent for Academic and Student Services Brennan Asplen. Also in attendance to support the students were School Board Chair Bill Mignon and School Board Vice Chair Kelly Barrera. Rebecca England, SJCSD program specialist for Elementary Language Arts, served as the spelling bee coordinator and the pronouncer was Linda Villadoniga, retired SJCSD teacher. Judges for the event were Jay DiMartino, SJCSD Language Arts and World Languages program specialist; Cheryl Freeman, SJCSD volunteer coordinator; and Sandy Waldeis, community representative. WFOY 102.1 FM broadcasted the spelling bee live and Murphy Alexander, SJCSD instructional television specialist, taped the event. The Spelling Bee will be broadcast on SEA TV channels 99 or 262 and available for viewing at www.stjohns.k12.fl.us/video.